Sometimes the most frightening moments in life take place during what at first appears to be completely ordinary circumstances. I highly recommend reading these stories in the order in which they appear in the book. Two of them are set in the same universe, and it’s much easier to understand what is going on in the second one if you’ve already read the first. They are also all arranged carefully by tone, length, and to some extent subject matter. “A Night Under the Stars” send a shudder down my spine. The dark tones are emphasized by how little the reader learns about the narrator or the dangerous man who shows up on his doorstep. Normally I prefer to know more about a character’s backstory, but in this case the mystery of their identities feeds into the quickly escalating tension beautifully. The sequel to this piece, “Monsters,” revisits the narrator when he’s once again faced with a different kind of danger. Both of them work best if they’re read in order and back- to-back. This is a character who really needs to be the star of his own series of adventures his own series. The handful of information I gleaned about his personality makes me eager to hear more from him. The first few scenes of “Offerings” are deceptively slow-paced. I did not realize it was nearly novella length when I started reading, so it was easy to overlook the subtle hints about what was actually going on because the pacing felt so uneven. This tale needs that extra time to sketch out the small town Tommy has recently moved to, though, and once the foundation is laid the rest of the plot unfolds rapidly. Ultimately the conclusion was well worth my initial confusion, but I would have liked to see a few more clues revealed a little earlier on to keep my interest in it as high as possible. “Last One Leaves the Light Out” asks more questions than it answers. The premise is quite intriguing, and the haunting descriptions of an abandoned world will remain lodged in my memory for a long time. While this isn’t the type of short story that is necessarily meant to answer every question the reader has about what really happened, I would have like to see the characters uncover a few more clues. The final scene ends abruptly due to the nature of the information the protagonists are able to figure out. Don’t skip the forewords that appear before each story. Mr. Felkel discusses how he came up with the idea for each one, and some of his sources of inspiration are quite unusual. While reading them isn’t strictly necessary in order to understand what’s happening, they do add depth the narrative and I found all of them to be well worth my time. 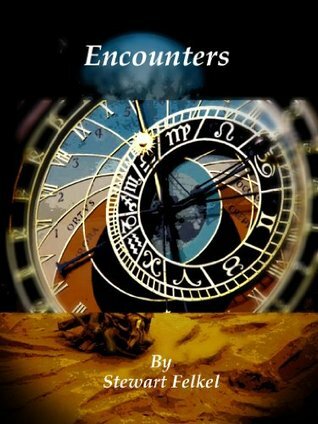 Encounters is a solid collection of stories that complement one another well. I highly recommend it to anyone who hasn’t read Mr. Felkel’s work yet. This is a very good introduction to an author I’m really looking forward to reading more from in the future.